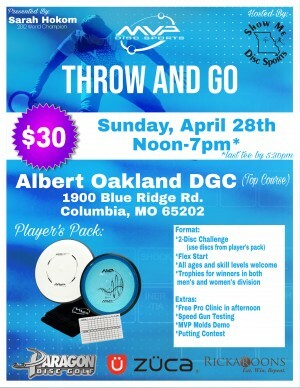 This event is an all day, flex start 2-Disc Challenge. All ages and skill levels welcome. You will play the event with the discs from your player's pack (one putter and one other disc of your choice---neutron or proton plastic). There will be trophies for winners in both the men's and women's divisions. Sarah will offer a free pro clinic during the afternoon and be available to give tips and answer questions throughout the day. There will be a speed gun available to test your arm speed, MVP molds available to test out as well as a putting contest to keep the fun going all day long. Sarah Hokom is responsible for all refunds and cancellations.